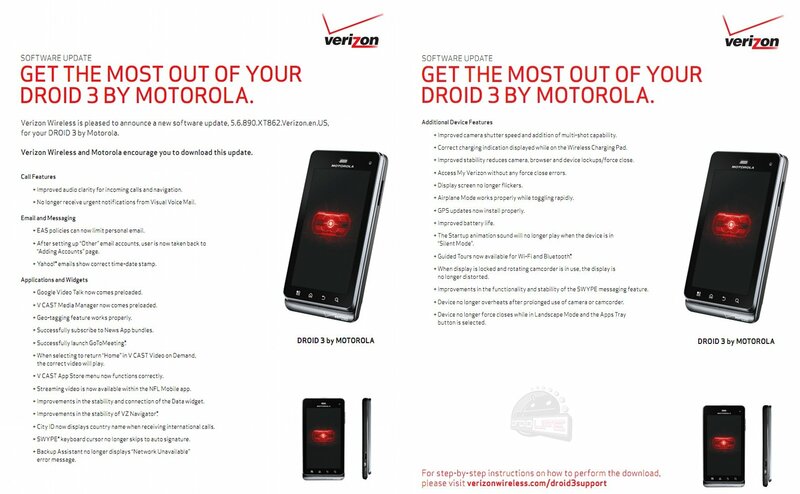 Earlier in the week we learned about a soak test that was being performed on the DROID3 which is almost always a clear sign that an update is just weeks away. Today, we are seeing the changelog for that update on Verizon’s servers – another good indication that the update should be here in no time. Normally when these things go up, we see the soak test begin within a day followed by the mass rollout within a week; assuming all goes well that is. So what can we expect? Google Talk with Video is the star of the show. Other than that, we get 30 or so bug fixes that will help to make the device and its newish Blur that much more stable. I found it odd though that they fixed bugs in some of the bloatware. Because the only fix that can truly be done to bloatware is by giving users the ability to uninstall it. Just sayin’. Soak testers, be sure to let us know when this starts going down! The new build is 5.6.890. The update is 57.6MB in size. More info.